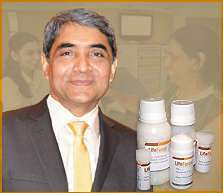 Besides some of the following ingredients, the product contains Dr Shah's international Patented, Research-based, highly effective medicines. Here are some common homeopathic medicines described in brief. Every case calls for a detailed study of the patient individually. The exact treatment is determined only by "in-depth" evaluation of the individual case. The medicines described below are commonly indicated in Lichen Planus, only for the purpose of information. The readers are advised not to indulge in any kind of self-medication. Rhus Toxicodendron is another common remedy used for urticaria. It is prepared from a plant commonly known as Poison ivy. The leaves and the bark of the plant contain a very poisonous resinous substance, which has an allergic effect. This drug positively affects multiple systems of the body including skin, joints, extremities, eyes, mucous membranes and the general vitality. It is commonly used for urticaria, cellulitis, arthritis, septicaemic states, fevers, etc. Rhus tox is a good remedy for urticaria that results from getting wet or from exposure to excess cold. Characterized by the severe burning of the affected part, inflamed rash with excessive sensitivity to cold. Swelling with redness of the parts. The urticaria is worse from cold in any form and is better by the warmth in general. Urtica urens is a drug prepared from a plant commonly known as stinging nettle or burning nettle. The long-range effects of nettles aren't very pronounced but it can cause pretty intense short-term annoyance. Nettles have little prickly hairs that stick in your skin and sting and itch like crazy. It almost instantaneously produces urticaria rash on coming in contact with skin. Urtica urens is a very good remedy for urticaria resulting from bee stings or after eating shellfish. Its peculiar symptoms are erythematous blotches with intense itching and burning. Symptoms are worse after exposure to cold air or water. It is good for recurrent urticaria where the urticaria keeps returning every year. Works well in cases of urticaria nodosa as well..
Natrum Muriaticum is an interesting example of homeopathic medicine prepared from a common food substance, the common salt, sodium chloride. As a rule, the common salt undergoes a special procedure called potentization, whereby its inner healing power is activated to make it available for healing. Constitutionally, this medicine has a broad spectrum of action, and is useful for a wide range of disease processes affecting the skin, gastrointestinal organs, nose, lungs, kidney, metabolism, muscles, head, hormonal system, etc. It is one of the commonly used remedies for urticaria, migraine, eczema, lichen planus, vitiligo, asthma, etc. Its one of the commonly prescribed remedies for chronic urticaria. The rashes peculiarly come on after exertion in these patients. It is the beauty of the Homeopathic system of medicine to be able to use not only plants, animal products, and minerals but also certain disease products and diseased tissue for curing various ailments of patients. You may say, it is an advance form of vaccines. These are called as Nosodes. Carcinosin is a remedy prepared from the material derived from the carcinoma of the breast. It must be borne in mind that the actual medicine does not contain any part of the original substance in the material form. Only the dynamic powers of the original drug substance are present in the final medicine. Carcinocin is a deep acting constitutional drug having many indications and a very broad spectrum of action. It is useful for a wide range of disease processes as discussed below. It positively influences mind, lungs, heart, eyes, skin, bones and joints, nerves, etc. It is one of the commonly used medicines for diseases like urticaria, vitiligo, lichen planus, styes and chalazion, hair loss, asthma, insomnia, trigeminal neuralgia, etc. Homeopathy believes that the genetic predisposition or inherent susceptibility is usually the root cause of a wide range of diseases and Carcinosin in one such remedy which is used to combat these genetic tendencies effectively. This is a remedy that is prepared from Jellyfish. It is one of those homeopathic remedies that are specific for urticaria. It must be remembered that the remedy does not contain the original drug substance in material form but contains only the dynamic curative powers of the drug. After undergoing the process of potentization, the hidden curative powers of the original substance are brought to the surface. Medusa is a very good drug for rashes of urticaria and prickly heat where there is the burning sensation of the skin and lentil-shaped eruptions on the skin. It is also a good drug for impending angioedema where there is puffiness of the eyes, face, and difficulty in speech. Astacus is prepared from the crawfish and is a wonderful remedy for Urticaria. It is one of those remedies where the skin symptoms most important. Patients requiring this generally have nettle-rash over the whole body with intense itching. It is also a good remedy for erysipelas. The patient has internal chilliness; he is very sensitive to air in general and is worse from uncovering.